Open Source software is used extensively on our projects. Open Source means a production and development environment that is exposed to innovation, and transparent to advances in technology. Free from the constraints of proprietary architectures and languages. With Open Source, “the code belongs to you”. Simply put, Open Source keeps your costs low, while taking advantage of a World Wide network of the best web developers available. In the 1950s and 1960s, computer operating software was delivered as a part of hardware purchases without separate fees. At the time, source code, the human-readable form of software, was generally distributed with the software providing the ability to fix bugs or add new functions. Many of the modifications developed by universities were openly shared, in keeping with the academic principles of sharing knowledge, and organizations sprung up to facilitate sharing. As large-scale operating systems matured, fewer organizations allowed modifications to the operating software, and eventually such operating systems were closed to modification. However, utilities and other added-function applications were still shared and new organizations were formed to promote the sharing of software. 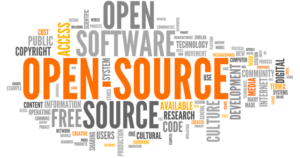 The open-source software movement is a movement that supports the use of open-source licenses for some or all software. The open-source movement was started to spread the concept/idea of open-source software. Programmers who support the open-source movement philosophy contribute to the open-source community by voluntarily writing and exchanging programming code for software development. The term “open source” requires that no one can discriminate against a group in not sharing the edited code or hinder others from editing their already-edited work. This approach to software development allows anyone to obtain and modify open-source code. These modifications are distributed back to the developers within the open-source community of people who are working with the software. This method makes it difficult to establish ownership of a particular bit of code but is in keeping with the open-source movement philosophy. These goals promote the production of “high quality programs” as well as “working cooperatively with other similarly minded people” to improve open-source technology. The Open Source Movement created equal opportunities for people all over the world to participate in the global economy. An open source tool puts the system administrator in control in deploying the tool. Open source provides flexibility not available in closed products. The hope is that individuals make improvements to an open tool and will offer those improvements to the original developer and community at large. The give-and-take of the individuals benefits the entire community. The Open Source Movement has allowed smaller businesses to participate in the global economy. Before smaller businesses did not have access to the software needed to participate or compete in the global market. It was the larger corporations, the producers of the networks and software who had the power. The creation of the Open Source Movement has created “a degree of global computing access that might have been unthinkable in a world where proprietary was the only option.” Individuals or organizations with access to an open source had the means needed to develop technical material for a variety of consumers. The Open Source Movement created equal opportunities for people all over the world to participate in the global economy. The open source mission statement promises better quality, higher reliability, more flexibility, lower cost, and an end to the large corporation and government monopoly of the internet. Simply put, Open Source keeps your costs low, while taking advantage of a World Wide network of the best web developers available today. Visit our VMPlus Home Page where you can find more information about our open source approach. VMPlus USA Supports the Open Source Initiative and is an active member of the WordPress and Joomla comunities.